Reading time: about 11 minutes. 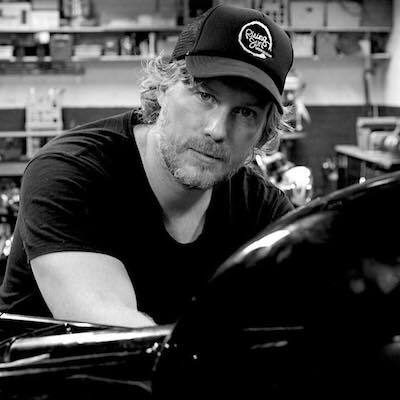 This is the third piece in a new series on Silodrome written by the talented Jason Cormier, Jason is a writer, an avid motorcyclist, a Ducati die-hard, and a shadetree mechanic based in Montreal. He’s the editor of Odd-Bike.com, a unique website that showcases the history of rare and unusual motorcycles from around the world. Six-cylinder motorcycles are some of the most excessive, useless, and magnificently overwrought machines you will encounter. A well-tuned four of equal displacement will easily do the job with far less complexity, but it won’t turn anyone’s head – if you want to get noticed, you have to go big and go excessive with your engineering. The list of six-cylinder motorcycles is, admittedly, a short one. For production machines you have the Benelli Sei, the Honda CBX, the Kawasaki KZ1300, and the current BMW K1600 and Honda Goldwing 1800. For race bikes you have the Honda RC166, RC174 and Laverda V6. Recently there has been a new addition to the list that has been garnering some attention, and it comes from a long-defunct German brand that came out of nowhere in 2010 to announce that they would build a six-cylinder roadster with an engine design unlike anything else on two wheels. Historically, Horex was a German assembler of motorcycles founded in 1923 as an offshoot of the Rex glassworks company in Bad Homburg (hence the name, Ho Rex). The company began by building machines around outsourced four-stroke singles supplied by German manufacturer Columbus, eventually merging with Columbus in 1925 to bring engine production in-house. 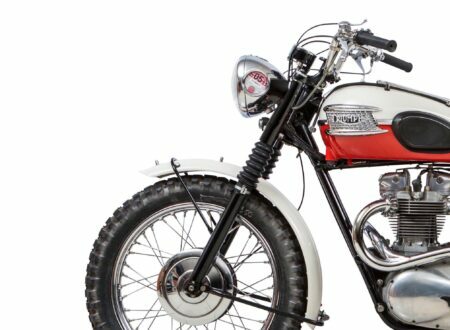 They produced a range of large displacement (250cc plus) singles and parallel twins that were well respected, with an occasional success in racing. Horex survived the Second World War and continued operating until 1956, when production was suspended after months of declining sales. Daimler-Benz then purchased the brand in 1960 and absorbed it into the DB empire. But the name was not dead. Friedl Münch, famous for his Mammut series of car-engined roadsters, purchased the rights to the brand in 1977. A massive 1400cc roadster dubbed the Horex 1400 TI was produced in 1978. The name was purchased again in the 1980s by Hörmann-Rawema and another attempt was made to revive the marque by building a series of sporting machines around Rotax and Honda four-stroke singles. Unfortunately, despite the production of some handsome and modern sport machines, the attempt didn’t succeed in reviving the storied brand and Horex laid dormant during the 1990s and 2000s. 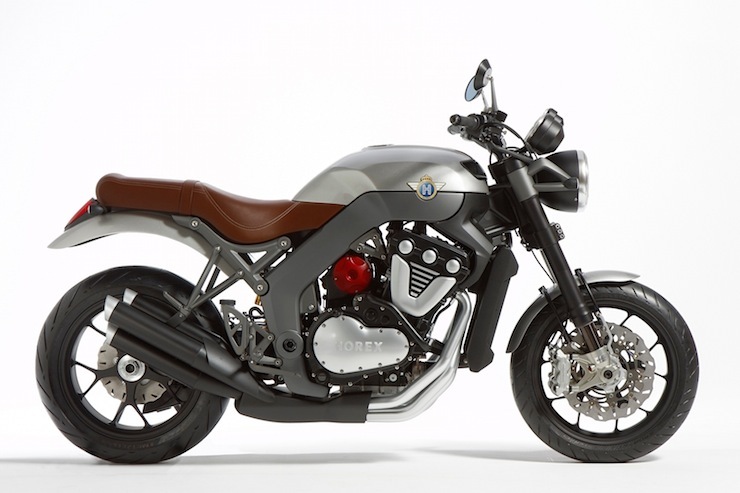 In 2010 Horex was resurrected once again, but this time with an entirely German design with an in-house engine. Some concept sketches and tech specs were released for a sport standard with a supercharged six-cylinder “VR6” engine. The motorcycling press was taken aback, and a more than a bit skeptical. A forced-induction six-cylinder machine? From a brand that had been dead for decades? 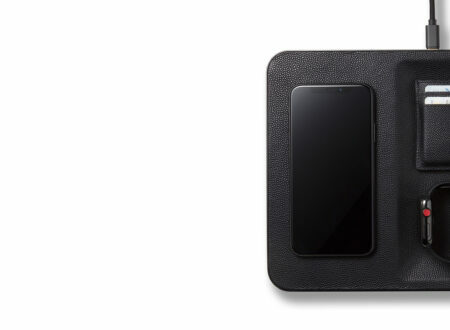 Slated for production within two years? With a (not-insane) projected price of around €20000? Many had seen such outlandish claims before from other newly minted manufacturers who would promptly disappear into the ether, often with a boatload of investor capital. But Horex was more than typical vapourware, and was working closely with a number of major German companies to develop their Roadster. Before we discuss the Horex Roadster, however, we must first talk about Lancia and Volkswagen. Piston engine layouts typically fall into three categories: inline, vee, and flat/boxer. The one setup you won’t find very often is the narrow-angle vee (or staggered cylinder) layout. Lancia was a pioneer of the format, introducing the 13-degree “Lambda” V-4 in 1922, and produced a series of narrow-angle designs up until the 1970s. A typical vee will have anything between 45 (Harley-Davidson V-twin) and 90 degree (Ducati L-twin). 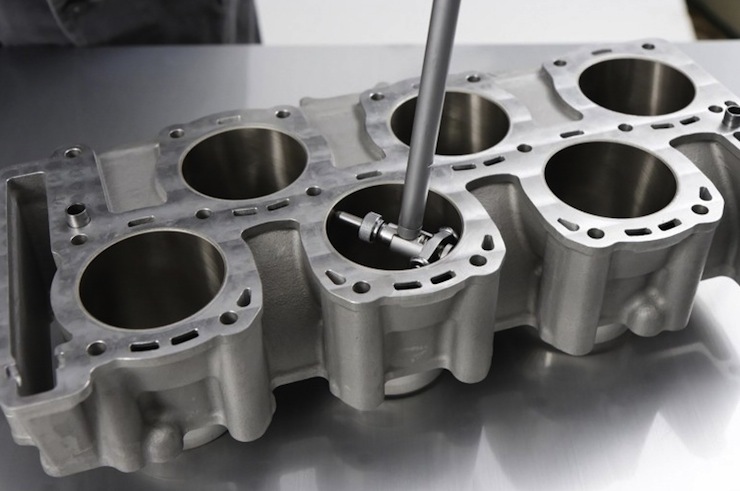 A narrow-angle vee (below 45 degrees) is so compact that both “banks” of cylinders can share the same block with a common cylinder head, making for a much more compact and lightweight package. You essentially combine the qualities of an inline engine with those of a vee – the block is as short as a vee, scarcely wider than an inline across the head, and shares the balance properties of an inline design. You get more cylinders into a much more compact package, with less complexity than a typical vee by combining the heads and block into a single unit. While Lancia pioneered the staggered cylinder layout, and achieved some notable successes in rallying with their Fulvia 12.5 degree V-4, it would be Volkswagen who would make the narrow-angle vee a mass-produced design. Developed in the 1980s and introduced in the early 90s, the VR6 initially used a 15-degree vee with a common crankcase and cylinder head and two overhead cams operating all 12 (later 24) valves. The VR designation is referred to as either a “Verkürzt Reihenmotor” (shortened inline engine) or a “Vee-Reihenmotor” (vee-inline engine), depending on whom you ask or which Wikipedia entry you trust. The engine was developed as a compact six-cylinder that could be fitted into a front-drive car designed to accommodate a four-cylinder – indeed, the VR6 was the same length as a typical four and only slightly wider. It was an easy fit into a compact engine bay, without needing major modifications, which allowed VW to offer a six into compact cars that hitherto had never had the option. The VR concept remains a signature of VW to this day, and has been further developed far beyond the original 2.8 litre, 12 valve six. The W8 uses the staggered piston arrangement to make an eight-cylinder engine that is the length of a V-4, while the VAG-engineered Bugatti Veyron uses a W16 layout based upon the design of the W8. The Horex VR6 takes the basic principles and name of the VW engine, but is otherwise a clean-sheet design developed in-house. 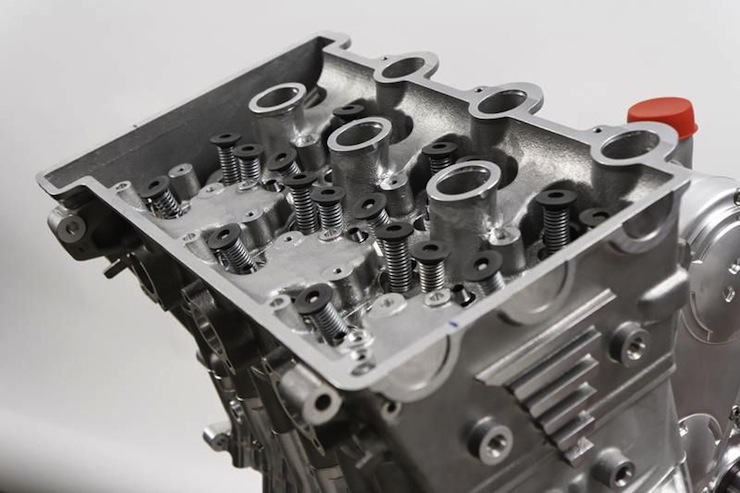 The liquid-cooled mill displaces 1218cc via an oversquare 68x55mm bore/stroke. The head is a one-piece design with a flat mating surface above the block. Because the cylinders are angled while the head is flat, slanted-deck pistons are used to maintain the 11.5:1 compression – slanted pistons were also used in the Lancia and VW engines, so it isn’t a new idea, but it’s still quite unusual. Unlike previous designs, the Horex uses a unique triple-overhead cam arrangement with three valves per cylinder. The front cam operates the exhausts of the front row of cylinders. The middle cam operates the rear bank of exhaust valves and the intakes of the front bank. The rear cam operates the intake valves of the rear bank. Very simple (apparently). It also makes the Horex the first TOHC production engine. To make things even more unusual, the Horex has radial valves – this means that the valve stems are angled out slightly so the valve faces encircle the dome of the combustion chamber, a feature shared with Honda RFVC singles and the MV Agusta F4. One problem of automotive narrow angle vees with one-piece heads is porting. The intake and exhaust ports are asymmetrical due to the staggered layout of the combustion chambers, which means half of the cylinders have longer ports. This causes tuning problems that need to be addressed by bolting on extended intake runners and exhaust headers for the “short” ports. 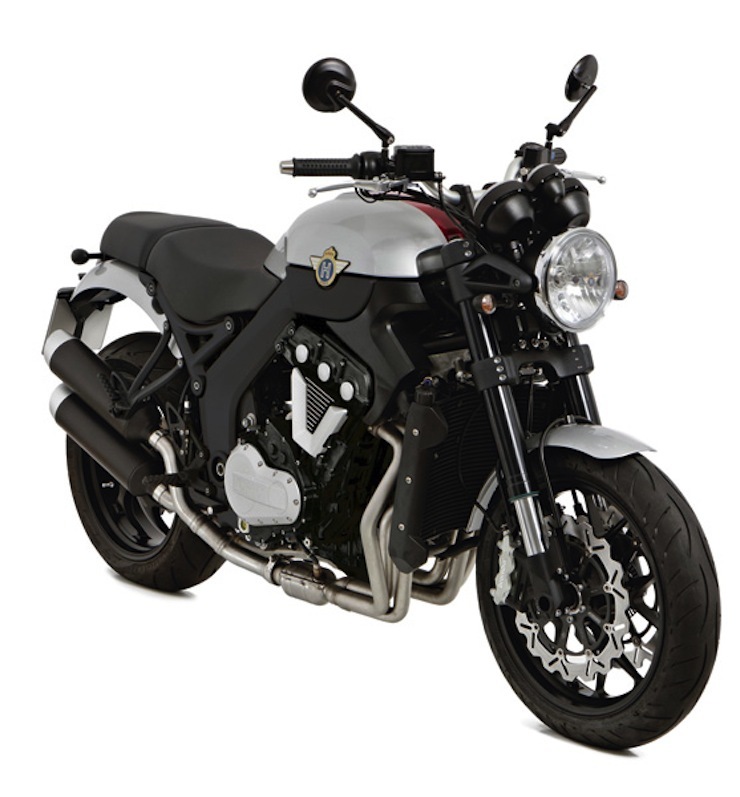 The Horex solves the problem by using asymmetrical exhaust headers and downdraft intake ports – the intakes run through the valve cover, with the airbox and throttle bodies placed above the engine. The initial prototype was shown with a belt-driven Rotrex supercharger nestled above the gearbox to the rear of the cylinders. Projected power was in the 200 hp range. At some point in development the (admittedly superfluous) supercharger assembly was dropped and the now naturally aspirated production engine was rated at 161hp with 101 lb/ft of torque. 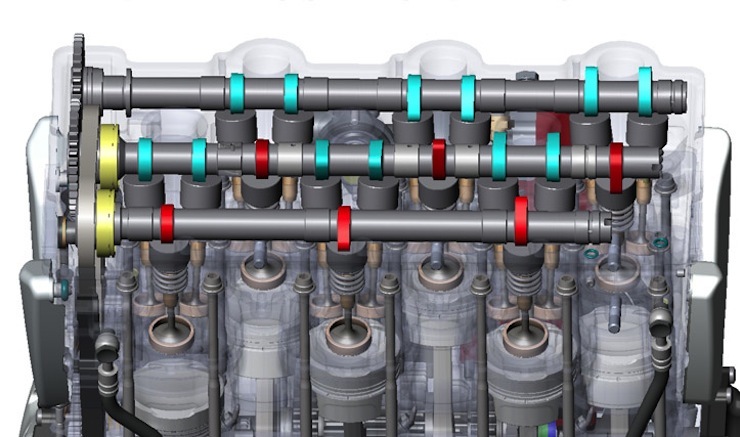 Extensive testing and dyno tuning has been performed to ensure reliability and tidy fueling. Peak power is at 8800 rpm and torque is claimed to be a fairly flat curve with the peak under 7000rpm, which should mean a fairly relaxed motor with a broad spread of power. The reviewers who were fortunate enough to sample the limited-production machine noted that power delivery is buttery smooth, strong and very useable. A VR6 has the advantage of possessing the same perfect primary balance and lack of rocking-couple flex you get in a straight-six, so its no surprise that journalists noted how smooth the engine was. It also has a distinctive engine note, not a turbine-wail like most inline-sixes, but a seductive growl that sounds like a CBX gargling gravel. 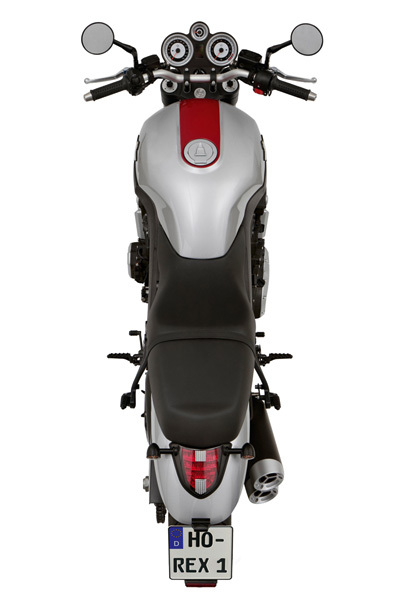 Chassis-wise the Horex uses a hybrid bridge frame that has a steel steering support mated to a pair of aluminum spars. 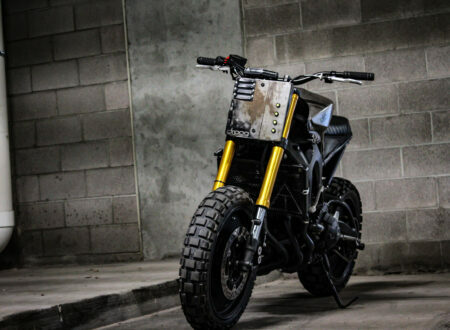 It looks like a sport bike twin-beam frame, except the spars are curved high over the top of the engine. This gives the machine a tall stance that shows off the big six while lending some serious visual mass to the complete machine. The VR6 does not look delicate, nor is it a lightweight – claimed dry weight is about 550lbs, hardly sport bike territory but a damn sight better than the 720lbs (dry!) BMW K1600GT, which is lighter still than the 800 lb gorilla Honda GL1800. 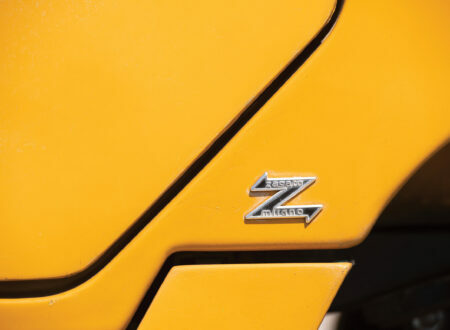 Sure, that might be an unfair apples-to-staplers comparison, but what else is there in the way of six-cylinder motorcycles on the market today? 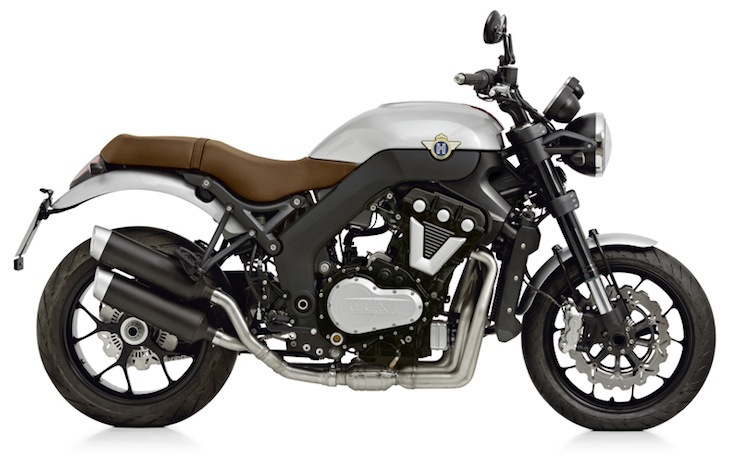 The Horex is certainly the definitive option in the burgeoning ‘more-than-four-cylinder-German-naked-semi-sporting-retro-inspired-roadster-from-a-previously-defunct-brand’ sector of the market. The Roadster’s styling errs on the conservative side without looking too much like a throwback. There is a brawny, hewn-from-solid appearance to the design with massive components and styling that looks clean and modern without aping the insectoid plastic-cladded designs from the East. I’d go so far as to say there is a hint of Teutonic automotive design in the slab-sided forms of the frame, tank and engine covers. 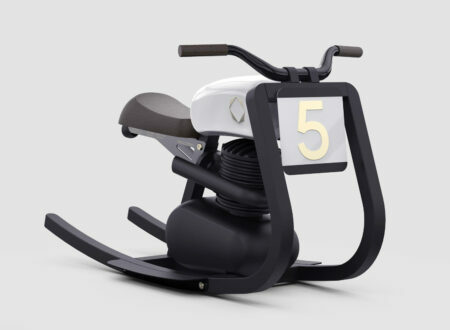 It’s not particularly groundbreaking but it has its own appeal in a market inundated with cheesy retro repops and plastic-addled two-wheeled spaceships. Suspension is via Works Performance at both ends – a beefy 48mm upside down fork up front, and a conventional rising-rate monoshock at the rear hooked up to a trendy single-sided swingarm. Brakes are from Brembo, with an advanced ABS system by Bosch. While the supercharged prototype was shown with a belt final drive, the production version uses a chain with an exclusive dry lubrication system. The chain passes over a block of solid graphite, which lubricates the chain and sprockets without oil or grease to fling all over the place. While this type of setup has been around for some time (and has some criticisms, particularly in terms of its penetrating ability on O- and X-ring chains) this is the first time it has been offered on a production machine. Supposedly you get longer chain and sprocket life without any maintenance or mess, and the dry lube won’t pick up road grime like sticky chain lube does. Production began, a year behind schedule, in 2012 with the first dealer deliveries in November-December. The Roadster is being built in a new state-of-the-art facility in Augsburg with the “one man, one machine” assembly philosophy to ensure impeccable quality control. A single technician, who follows the bike along a multi-step assembly line, builds each individual machine. It’s reminiscent of the production line of boutique brand Bimota, who have a single mechanic assemble a bike in a stationary bay, with slightly more efficient German methodology. 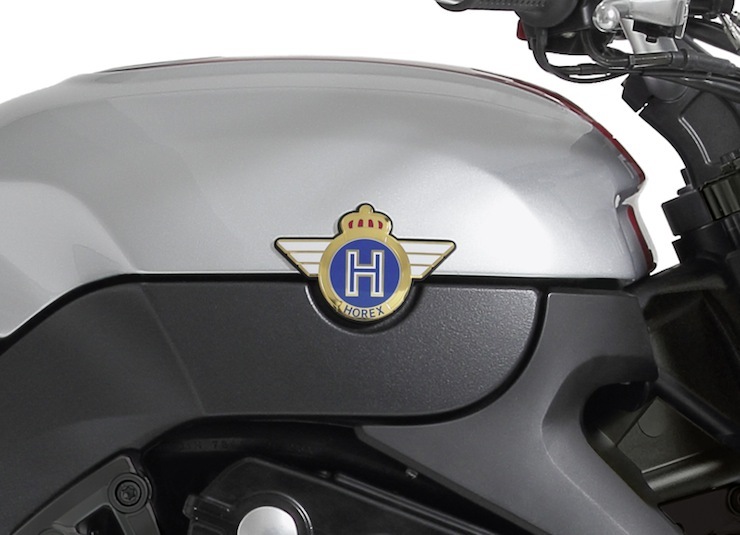 Remarkably Horex boasts a rather impressive dealer network considering their relatively recent appearance on the market – in 2012 35 dealers were announced across Germany, Switzerland and Austria. Current retail price in Germany is € 22500, not far off the original target price. The Horex VR6 Roadster is, at its core, a teutonic bruiser that has no peers in the market. 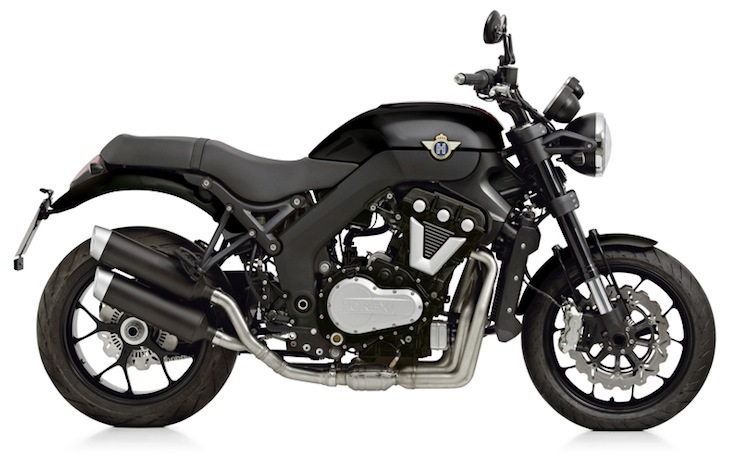 Sure there are big naked muscle bikes available from other brands but none offer the technical prowess of an ultra-compact and powerful six-cylinder powerplant. Nor do they offer the cachet and hand-assembled quality of the Horex. While the initial specs might have seemed improbable, the VR6 is here and is in showrooms more or less as-promised, a testament to the determination and skill of the company’s team in bringing such an advanced and unusual design to production in a relatively short period of time. Many brands have failed while offering far less exotic products, but Horex has weathered the initial doubts to produce one of the most interesting production machines to come out of Germany in a long time. Not only that, the VR6 adds another machine to the pantheon of legendary six-cylinder motorcycles, a rarified breed of exercises in engineering excess. 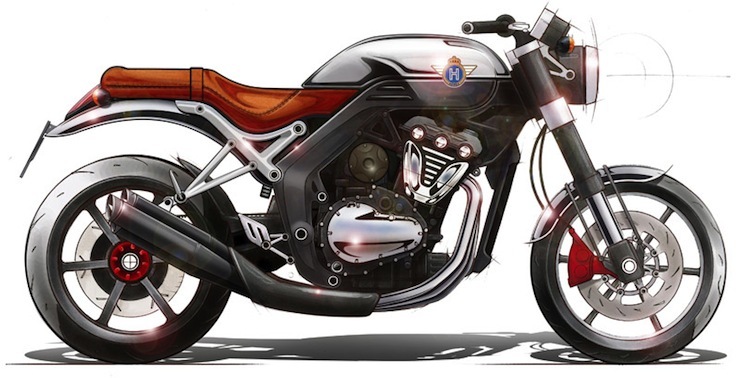 Had Horex gone the conservative route and built a traditional four-cylinder roadster of similar specs, we wouldn’t be talking about it today, and you likely wouldn’t be drooling over it right now. If you want to get an inordinate amount of attention in the world of motorcycling, you must build a six.